This book came at the perfect time for me. I'm feeling overwhelmed with having three children and running a household. The house has been constantly untidy and it's drivng me crazy. Tip #41 Always take into account your child's personality in establishing both routines and rewards. Tip #136 Use a string and clothespin to create a custom border in your child's room. Tip #232 If you are totally overwhelmed by what you see when you look around your house, call in help. There are a lot of great tips in this book. I only put #232 down because that is how I feel somedays and the only person I can call in for help is my husband but it's nice to dream. Since starting this book, I am feeling more organized and not so bushed all the time. I take it one day at a time and fill out a calendar for the week so I know what is planned. 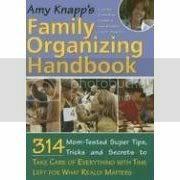 I definitely recommend this book, not just to moms feeling disorganized but everyone who is trying to remain organized at home and out. One may not be able to use all of the tips in this book but a lot of them are definitely worthwhile.